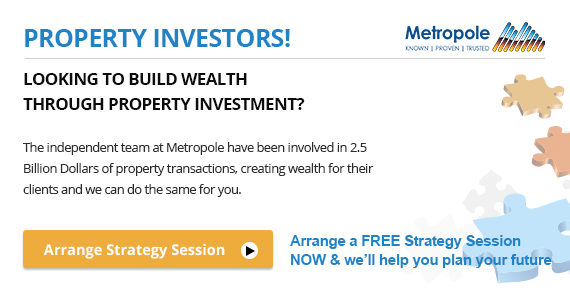 What’s a head for our property markets? When will the markets stabilise? 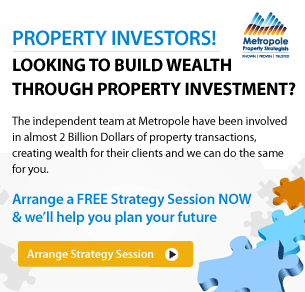 How much longer will Sydney and Melbourne property prices fall? That’s what many economists and research houses are spending much of their time researching at present. ANZ Bank recently reported to their wholesale and institutional clients that the signals are conflicting at present. And the bank sees little reason for thinking the pace of house price declines will ease in the very near term, at least. 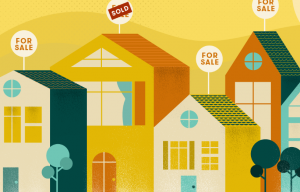 We look at a variety of indicators to try and assess the state of the housing market, among them the auction clearance rate and the housing credit impulse. These indicators tend to be coincident with house prices rather than leading. Here, we look to them to provide confirmation of the trend or evidence of a turn. These indicators are now diverging sharply. While this is not the first time, the degree of divergence is extreme. It is possible that the auction clearance rate will lose meaning as an indicator in a world where it takes much longer to secure mortgage financing than in the past. Indeed, the role of auctions may diminish sharply – with the change being structural rather than the usual cyclical downturn (which sees auctions lose favour in a weakening market). In which case the uptick in the credit impulse may be a better signal about the state of the housing market than the still falling auction clearance rate. But even if this is the case, we aren’t confident the uptick in the credit impulse will be sustained. 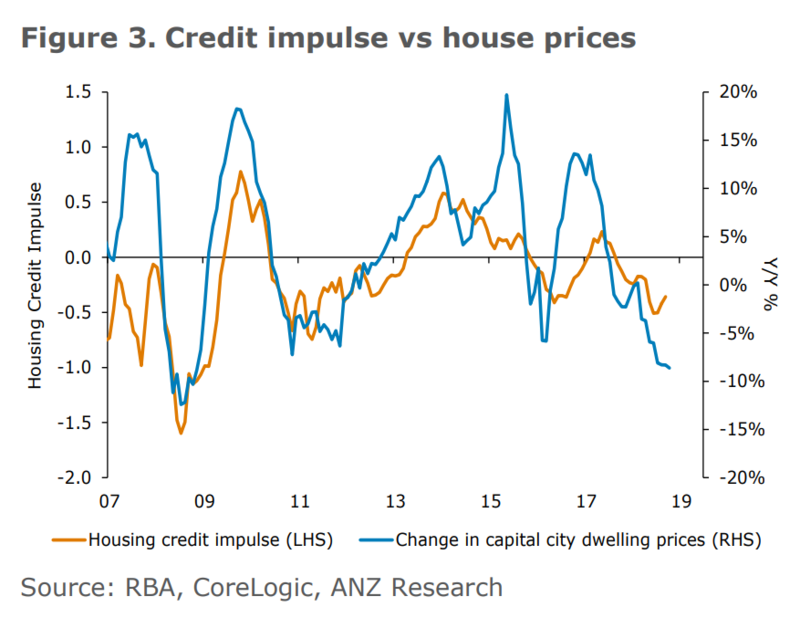 The downturn in housing finance approvals suggests it won’t be, leaving us struggling to see much evidence that the pace of house price’s decline will ease in the very near-term at least. In trying to gauge the state of the housing market we pay attention to a number of indicators. Among these, the auction clearance rate and credit impulse feature quite often in our analysis. While they tend to be coincident rather than leading indicators of house prices (Figures 2 and 3), we look to these measures as confirmation of a continuation or change in trend. As it so happens, the auction clearance rate and the credit impulse are diverging sharply (Figure 1). This is not unprecedented, but the degree of divergence is particularly stark. 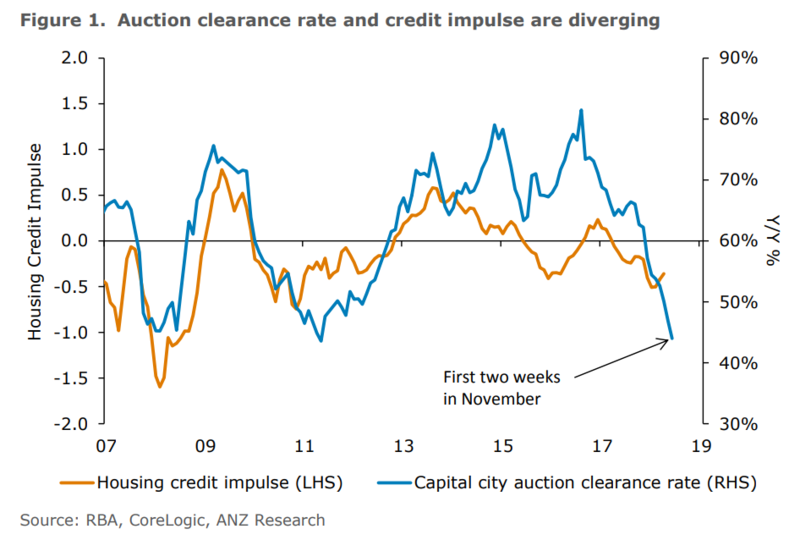 History suggests we should pay more attention to the still falling auction clearance rate than to the housing credit impulse which appears to be turning up. 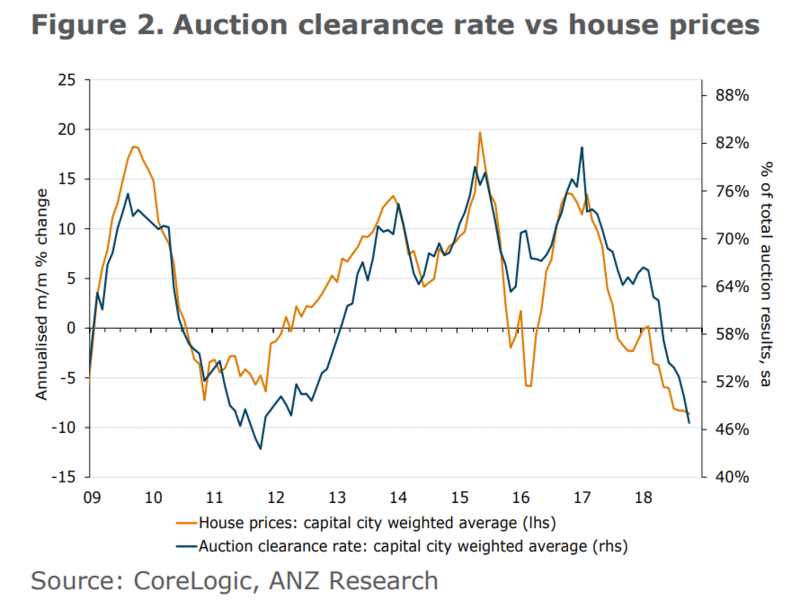 When the two have diverged in the past, house prices have tracked the auction clearance rate rather than the credit impulse. But we aren’t sure this will be the case in the current cycle. 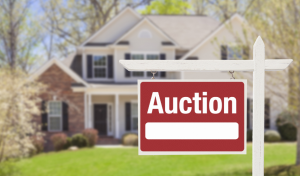 To be specific, we are wondering whether auctions make much sense as a way of taking a property to market when it takes an extended amount of time to secure mortgage finance. If auctions lose favour as a means of transacting, then the information content in the auction clearance rate will diminish. Perhaps it will be the case that continued weakness in the auction clearance rate will not be a sign of ongoing house price weakness. But we are loath to take too much comfort from the small uptick in the credit impulse. 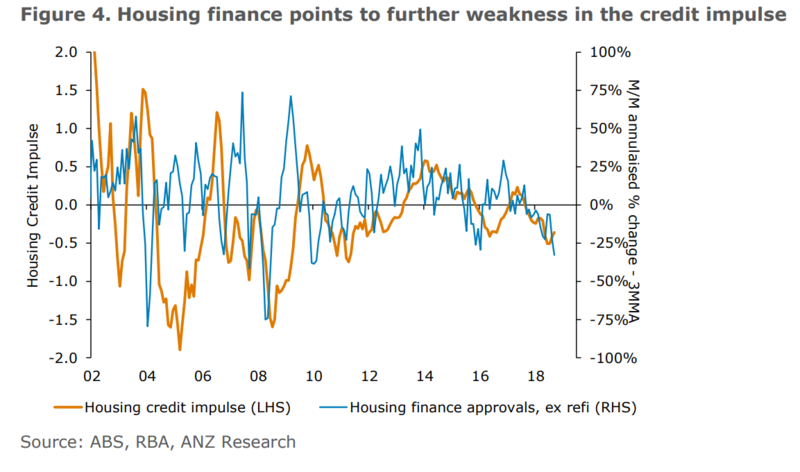 The weakness in housing finance approvals suggests this uptick won’t be sustained (Figure 4). We see little basis for thinking the pace of house price declines will ease in the very near term, at least.